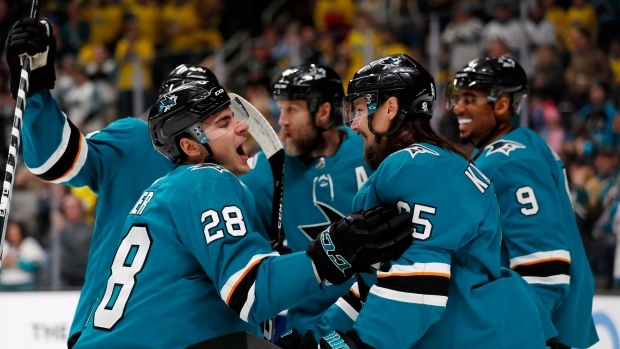 SAN JOSE, Calif. — Joe Pavelski, Logan Couture and Timo Meier each had a goal and an assist, and the San Jose Sharks topped the Vancouver Canucks 3-2 on Saturday night. Jacob Markstrom had 23 saves for Vancouver. Sharks All-Star defenceman Erik Karlsson had an assist on Meier's goal in his first game back after missing nine games with a groin injury. Karlsson has at least one assist in 17 of his last 19 appearances.